Snapshot of Japan – The mission stretches from Tokyo down to Hamamatsu, which is a small area but has a huge population. Japanese is the primary language of Japan, though many modern schools require students to take classes in English as well. Japan is a largely non-religious country, with many people claiming no religious affiliation whatsoever. The majority of those that are religious practice a mix of Buddhism and Shintoism. Most Japanese people participate in a variety of Shinto and Buddhist rituals, regardless of how actively religious they are – for example, most Japanese funerals follow Buddhist traditions and are performed by Buddhist priests. Japan has a very unique culture, as manifested in traditional paintings, sculptures, woodblock prints, and architecture. In modern pop culture, video games, manga, and anime are all extremely popular. Performing karaoke is also quite popular. Japan’s national sport is sumo, though the martial art forms of karate, kendo, and judo are also widely practiced. Baseball is one of Japan’s most popular sports, though soccer also has a following. Rice is the staple food of Japan and is served with almost every meal. Miso soup is also served with most meals. Seafood and tofu are regular parts of meals as well, though other types of meats can also be used. In Japan, chopsticks are used to eat, and it is considered rude if you do not finish all the food you are given. Missionary work was first started in this region by Heber J. Grant in Yokohama, part of the Tokyo South Mission. There is good leadership at the ward and stake level, however, the branches typically need more priesthood help. There is a high need to reactivate members of the church who were baptized during a period of mass church growth during the 80’s. Converts of the church in this area tend to be women. Portions are typically smaller than you experience in the United States and generally more expensive, especially in Tokyo. Grocery stores carry American food items such as cereal, milk, eggs, beef. Members will often try to impress you with an American meal, like Pizza. A common Japanese meal is Sukiyaki, vegetables and meat cooked on a hot plate, served next to rice with an occasional raw egg used as dipping sauce. There are many American fast food restaurants available throughout the mission. 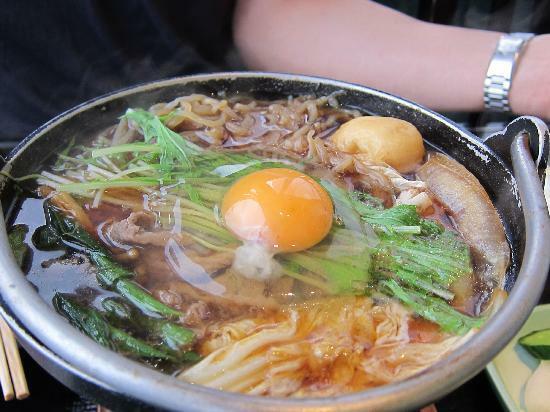 Sukiyaki with raw egg, a common Japanese meal. Image courtesy of TripAdvisor. Transportation in Tokyo Japan is efficient and fast-paced. Most missionaries use bikes, however, in the city it is common to use the train system. When traveling from the north to the south mission missionaries might use the popular high-speed trains. Compared to the United States, driving is done on the opposite side of the road, which can be confusing for the few missionaries assigned to drive mission vehicles. Porters stuffing passengers into a crowded train. Photo courtesy of The Atlantic. Japan is very safe. The culture is very non-violent as a whole which leads to little crime. The police and armed forces are well organized and trained. They are the only ones permitted to own firearms. Wikipedia report on Japanese crime rates. Bring slip on shoes because you are always taking your shoes on and off as you enter people’s homes. This is a common Japanese custom. Missionaries are required to wear suits on specific days. During the summer you are able to wear short sleeve dress shirts. *What advice would you give to someone going to the Japan Tokyo South Mission?